Car Lift 2-post I-10 Certified Derek Weaver Co., Inc.
Our dear friend, Bo McGee, created the Forward® brand in 1968. Known for their outstanding quality and competitive prices, Forward® Lifts became an instant hit. Buyers across the country pushed Forward's sales to some very high numbers. So high that the value of the brand caught the attention of the largest lift manufacturer, Dover. Dover acquired Forward® in 1999 and has kept the same quality, features and value throughout the full line of Certified Forward® Lifts. Free Shipping To Over 85% of the USA - See Where It's Free Local Sales Tax may apply when shipping from Madison! Today, Forward® Lift's i10 is the brands popular choice for overall quality at an exceptional value in a 10,000-lb. capacity 2-post lift. The i10 still utilizes the Original and Proven Direct-Pull Hydraulic Cylinder system, single point lock release, Super Symmetric Spot-Rite Arm System and is backed by one of the best warranty in the industry. The I10 is now manufactured by the VSG* division of the Fortune 300 Dover Corp. (NYSE:DOV). Based Here, Certified Here and Insured Here in the USA. Dover is the Largest Lift Manufacturer in the World and enjoys over 80% market share of the car dealership business in this country. Why? Because they take care of business, before, during and especially after the sale. You simply cannot get the "Peace Of Mind" from any other lift manufacturer than you have when you own a Dover product. Over 80% of car dealerships get it right and "Get It Up" with Dover. 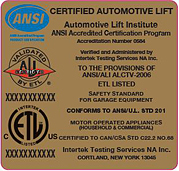 Forward® Lift's i10 is a proven commercial grade automotive lift with ALI/ETL Certification. The i10 features 2 Direct-Pull Hydraulic Cylinders, an exceptionally low pad height of 3 5/8" and the versatile Spot-Rite 3-Stage Front Arm System. The New Offset 3-Stage Front Arms give you an additional 5 3/4" of retraction allowing your choice of either Asymmetric or Symmetric lifting making the i10 lift perfect for both passenger car and truck applications. The Rear arms are 2-Stage to allow both lifting methods. Forward® Lift also implemented an Adjustable Overhead Beam which allows for two width settings. The standard outside overall width setting of 137" or the narrow setting of 131". The Forward® i10 is manufactured by Dover Corp.'s Vehicle Service Group in their state of the art ISO9000 certified manufacturing facility and is a popular choice among many of the largest car dealers in the USA. Backed by Forward's 5-Year Structural Warranty, 1.5 Year Parts Warranty and a 6 Month Labor Warranty, the Blue Powder-Coated i10 lift comes with all mounting hardware and three sets of stackable lift pad height extensions for maximum adaptability. Automatic Heavy Duty Arm Restraint System with oversized steel gears, pins and springs for trouble free operation. Stackable Lift Pad Height Adapters in 3 sizes (4 Each) 1 1/2", 3" and 6"
Minimum Pad Height: 3 5/8"
Overall Floor Width: 131" or 137"
Inside Column Width: 109 3/4" or 115 3/4"
Drive Thru Width: 99" or 105"
Lift Pad Adapter Heights: 1 1/2", 3", 6"
Front Arm Length: 23" - 44 1/2"
Rear Arm Length: 38 7/8" - 58"
The Forward® Lift i10 is proudly manufactured by Dover Corp.'s Vehicle Service Group (VSG). VSG comprises nine major vehicle lifting and collision repair brands: Rotary® Lift, Chief® Automotive Technologies, Forward® Lift, Direct-Lift®, Hanmecson®, Revolution® Lift, Elektron, Blitz® and nogra®. Based in Madison, Ind., VSG has operations worldwide, including ISO 9001-certified manufacturing centers in the U.S., Europe and Asia. this looked like the best deal on Forward 2 post I could find. My dad has one that is still in use today bulletproof. We decided to add another it works great! Solid lift and staff has great communication. Great customer contact after purchase.Super fast shipping. Very nice product. Straight forward installation. Well worth the $.